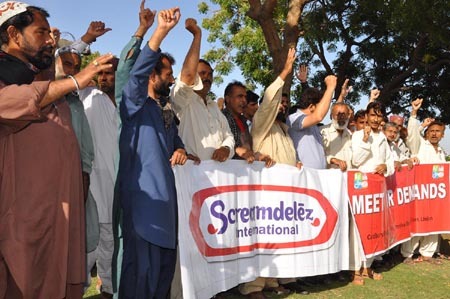 Management at Kraft Foods Pakistan (formerly Cadbury, now Mondelez-owned) has moved to lock out union workers in retaliation for the union's defense of the rights of the factory's hundreds of contract workers. Mondelez makes Cadbury confectionery products in Pakistan at a factory with 53 permanent and over 350 contract workers, over 150 of whom are in 'core' manufacturing jobs. A deadlock developed in negotiations last December when the union demanded that precarious workers share in wage and benefit increases and called for a clear process to create permanent positions. Management responded by victimizing union leaders and on March 14 initiated disciplinary action against union president Muhammad Saleem aiming at his suspension or dismissal. It is illegal to do this during CBA negotiations. The union gave strike notice for April 1 and management filed for a lockout. Tunisia, Egypt and now Pakistan - where next?